The high vacuum pump articles provides guidance and review about different types, qualities, durabilities, and prices. These Pumps are used to create the vacuum in high-pressure range. The pump operates in the same way as the other vacuum pumps. They transfer gas, air or vapor molecules by creating a partial vacuum. This kind of pumps can operate as a single pump unit or multi-stage pumps. In multi-stage pumps, each stage acts as the booster for the pressure range and helps in achieving the high vacuum condition. These pumps operate in very dry conditions and so are called as dry vacuum pumps. Dry pumps require lubricants or oils for smoother operation. The gas molecules and motor are separated by Dry seals made up of PTFE. High vacuum pumps are mostly diaphragm type pumps. Lubricants are also required for gears and moving parts in the motor. The gas molecules free from contamination of oil molecules and are able to produce the clean and pure form of the gas. Low vacuum – pressure range of atmospheric pressure to 1 torr. Medium vacuum - pressure range of 1 torr to 10-3 torr. 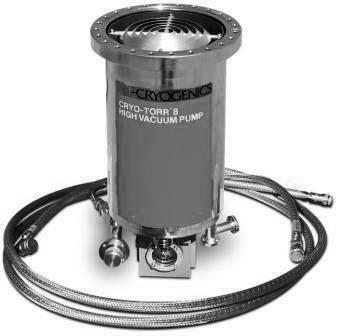 High vacuum - pressure range of 10-3 torr to 10-7 torr. Vacuum pumps that are able to generate vacuum above pressure ranges of 10-3 torr come under high Vacuum pumps. Further, these pumps are classified based on their operation as the gas capture or gas transfer pumps. Gas capture pumps- These pumps capture the gas molecules on the special surfaces within the system. These pumps operate only at low flow rate and can produce the vacuum to the high-pressure range of about 10-12 torr. They are oil-free and have no moving parts. And are used in the cryogenic applications. While selecting a high vacuum pump, the following specifications must be considered for the effective operation. Ultimate pressure – it is a measure of the ultimate vacuum pressure, a pump can achieve. It is measured in torr. It can be determined by running the pump blank at the inlet side and noting the pressure value using a pressure gauge. It is also denoted in other pressure units like Pascal, bar, etc. Pump rate – volume of the gas removed by the pump in unit time. It is described as the pumps ability or capacity to remove gases in a certain period of time. It is denoted in units of volume per unit time. It is measured as Gallons per minute (GPM). They are used in the laboratories for various research operations such as photolithography, electron microscopy, etc. They are used in the process of vacuum coating on the glass, metals, and plastics. They are for hard coating of the engine components on the race cars. They are used in various applications such as freeze drying, degassing, gel drying, etc. They are also used to provide assistance to the mechanical drives in the hybrid vehicles and diesel engines. They provide power supply to the camshafts. They are used in the gas bottle filling and emptying application used in CRT, electric light, and bulbs for filling the bulb chambers with the inert gases. They can be used to determine the leakages. They are also used in the hydraulic brakes, cruise control system, dampeners in the ventilation and door lock mechanisms. Some of the market leaders in the manufacture of the high vacuum pumps are Leybold, Edward, Dynapumps Corp., Vac Aero International Inc. and Rex pumps. These kinds of pumps operate at the high-pressure range and are suited for use in the industries, research centers, and labs. They are not suitable for domestic and household purposes. Their price ranges vary from 250$-500$ for a standard operating pump. The specially designed custom pumps used in labs may cost around 5000$-6000$ depending upon their pressure requirements, capacity, and other pump parameters.